Wolverhampton was recently awash with black and gold as the city celebrated its beloved football team, Wolverhampton Wanderers, once again taking its (rightful) place in the Premier League. But the success story isn’t confined to the beautiful game, the city’s housebuilding industry is very much on the up too. Smith also sees many housebuilders flocking into the city to take advantage of cheaper land values and, in part, because of its forward-thinking city council. Unlike many parts of the UK where new build is faltering, Wolverhampton is experiencing a rash of new schemes as regeneration cash pours into this once grand, former manufacturing city. The new build is aimed at investors, first-time buyers and families, with build to rent expected to be the next focus believes Smith: “Values here haven’t risen as fast as build costs so investors aren’t yet getting the yields they want but they will do and they’ll also see strong capital growth.” Connells is selling Belvedere Residence a city scheme of 42 apartments starting from £99,995 for one bedroom. In Birmingham however, Knight Frank is selling apartments at The Bank starting from £145,000. Wolverhampton is one of the top 10 growing economies in the UK, according to the Demos-PwC Good Growth for Cities Index, and it’s currently enjoying record levels of private and public investment with £3.7bn pounds being injected into regeneration projects citywide, including £992m in the centre alone. Key major developments include the £55m leisure-led Westside, which will have 300 new city centre homes, and plans are underway for the development of city-centre living at Canalside, where over 600 homes are proposed. Near the football stadium, the club is working with the council on Molineux Quarter, to create a northern gateway to the city with a new business school alongside. Two independent Midlands construction firms recently formed a partnership with the City of Wolverhampton Council to give the city’s regeneration plans a boost. Privately owned developer Jessup Brothers is the main contractor for the construction of 52 houses on the site of the former Danesmore Primary School, with Telford-based concrete block manufacturer Besblock Ltd a major part of the supply chain. This underpins the council’s initiative to drive local growth and prosperity, helping to create jobs and opportunities for local people and businesses. And it’s a timely union for the construction industry, coming on the back of the high-profile demise of Carillion, based in the city centre. I grew up within sniffing distance of Springfield Brewery, a grand building in the north of the city that produced its famed pale ale, Springfield Bitter, until it fell into disuse and was destroyed by fire in 2006. The site is now set to become home to one of the biggest environment hubs in Europe as the University of Wolverhampton pushes forward with its £100m investment in the 12-acre Springfield Campus. Plans for the University’s School of Architecture and the Built Environment have now been approved. Associated Architects has designed the building, which will contain specialist teaching and social learning spaces, design studios, labs, multidisciplinary workshops, lecture theatre, café, offices, meeting rooms, ICT rooms and a top floor super studio. When complete, it will provide space for nearly 1,100 existing students and 65 staff, with the number of students projected to grow to more than 1,500. The school joins the West Midlands University Technical College (UTC), which opened last year on the site, and the Elite Centre for Manufacturing Skills Hub, set to open later this year. 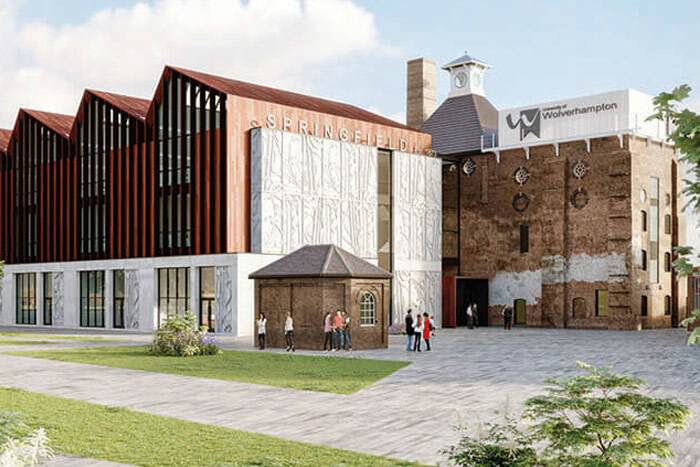 The site of the former Springfield brewery has been transformed into Europe’s largest specialist construction and built environment campus, bringing together businesses and the education sector to maximise impact on the economy. Tim Johnson, City of Wolverhampton Council deputy managing director, says that the UTC, Elite Centre for Manufacturing Skills (ECMS), and the relocated School of Architecture and Built Environment “will help raise the bar when it comes to skills and employment in the city”.